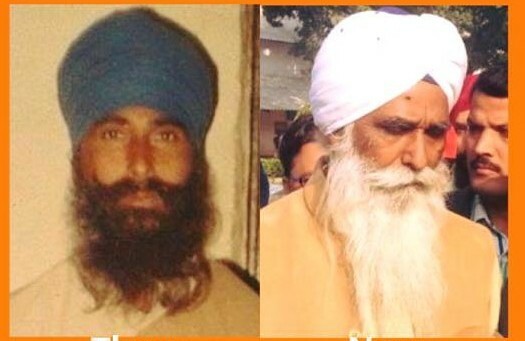 Bhai Wariyam Singh has finally been released on parole after 25 years in prison. He was in U.P. 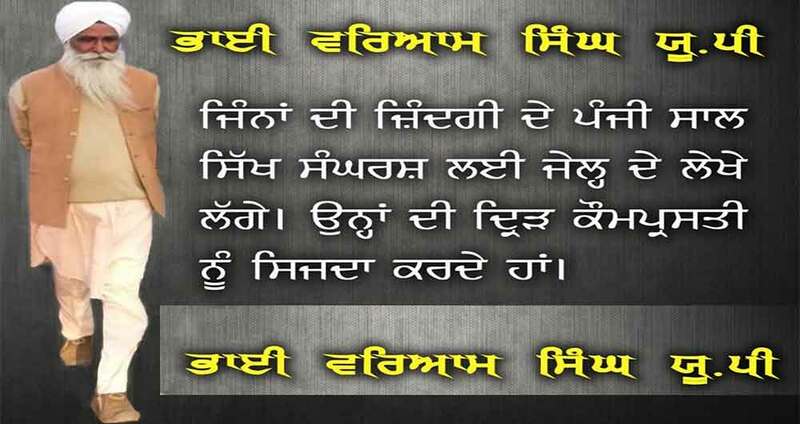 Salute to Bapu Surat Singh’s Struggle. UTTAR PARDESH, India—With the recommendation of the Akhilesh Yadav led Uttar Pradesh government, 70 years old political Sikh prisoner Bhai Waryam Singh has been released today from Bareilly jail after an imprisonment of 25 years and 8 months. Bhai Waryam Singh is a resident of village Bari Bara of Shahjahanpur constituency and has been languishing in the Bareilly jail since April 17, 1990. Bhai Waryam Singh was held guilty in a case registered against him under sections 3 & 4 of TADA (Terrorists and Disruptive Activities (Prevention) Act) and 120-B of IPC (Indian Penal Code) by a designated Judge on January 10, 1995. He was sentenced with a life term by the Court. His co-accused addressed with the same sentence, Major Singh, was released in 2013 by the Uttar Pradesh government. Bhai Waryam Singh’s release was approved by the Union Home Ministry some weeks ago after considering his old age and good conduct. But a case under 120-B registered against him at that time became an obstacle in his release. 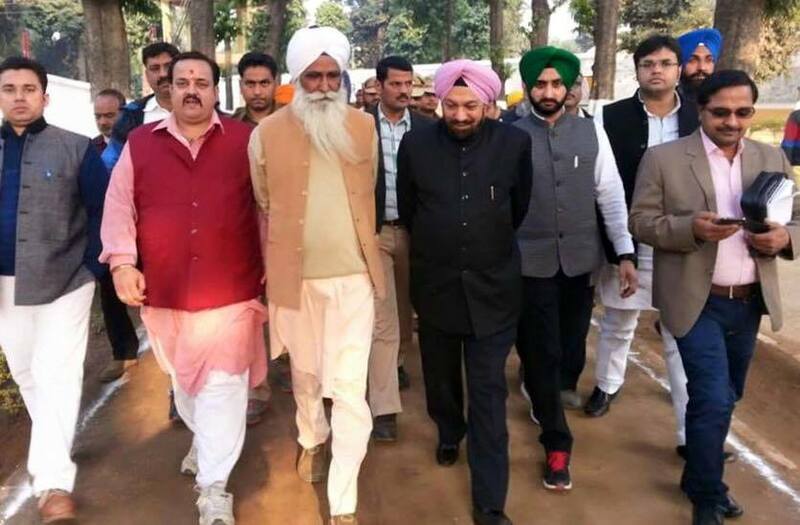 Meanwhile, the Advocate Jaspal Singh Manjhpur has ruled out the claims of Akali Dal (Badal) that they were instrumental in the release of Bhai Waryam Singh. He has said that the matter of releasing Bhai Waryam Singh was solely concerned with the Uttar Pradesh government and Union Government of India. He added that the Akali Dal (Badal) was trying to take credit of the premature release of Bhai Waryam Singh but in fact they didn’t have any connection with his release. Yesterday, a spokesperson of Akali Dal (Badal) and Education Minister Dr. Daljit Singh Cheema had met Bapu Surat Singh Khalsa to discuss the release of political Sikh prisoners and force him to give up his struggle. His meeting with Bapu Ji is now being considered as an attempt to hijack the credit of Bhai Waryam Singh’s release. Advo. Manjhpur appreciated the initiative of Akhilesh Yadav led UP government for recommending release of Bhai Wariam Singh. He said that the Centre should continue with the line adopted in Bhai Wariam Singh’s case and other eligible Sikh political prisoners should also be granted premature release without any undue delay.